Buy Amazon between its 200-day simple moving average at $1,700 and my semiannual pivot at $1,546.97. I am an Amazon Prime member willing to pay the $119.00 annual membership fee. Combine this with an Amazon credit card gives me some discounts plus rewards associated with the credit card -- great for holiday purchases. One issue that Amazon faces in 2019 is a higher delivery fee from the United States Postal Service. If you live near an Amazon Fulfilment Center, odds are that the gifts you purchase are delivered to your door via USPS. If Amazon is forced to pay more, it will likely cost an additional $1.50 per parcel. Even so, Amazon is the stock to own, if you believe in Santa Claus. 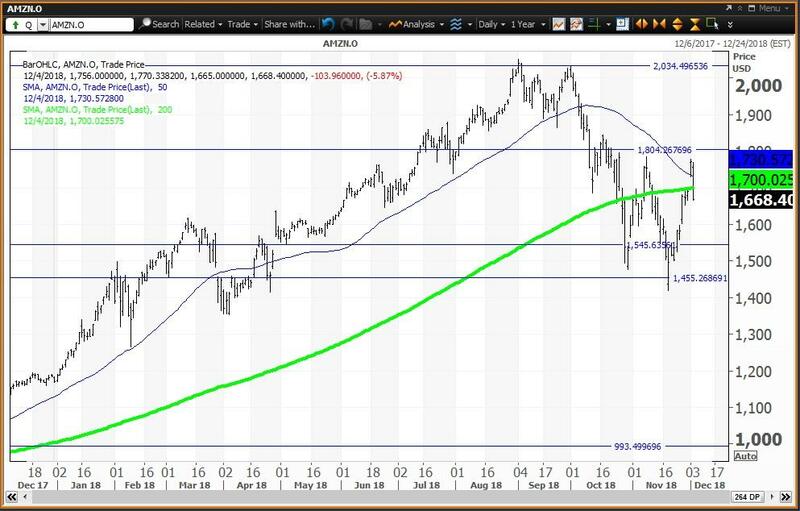 The daily chart for Amazon shows that the stock set its all-time intraday high of $2,050.50 on Oct. 3 and the horizontal line at the top side of the chart is my monthly risky level for December, which should not come into play. The second horizontal line is my quarterly pivot at $1,804.55, which was a magnet between Oct. 10 and Oct. 22. When this gave way, the downside risk became my semiannual pivot at $1,546.97, which was a magnet between Oct. 29 and Nov. 26 and is now the low end of my buy zone. The upper end of my buy zone is the 200-day simple moving average at $1,700. At $1,546.97, the stock falls into bear market territory 24.6% below the high. At $1,700.00, the stock is in correction territory down 17% from the high. At $1,804.55, the stock is still in correction territory, 12% below the high. 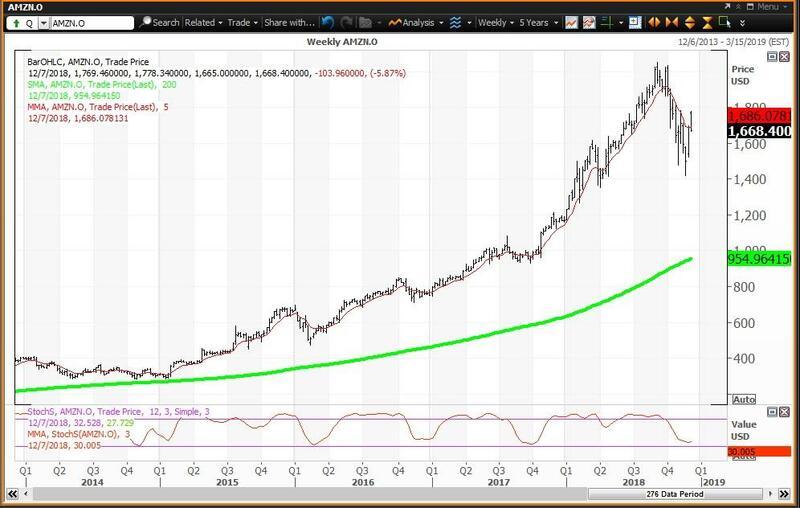 The weekly chart for Amazon will end the week positive if the stock closes above its five-week modified moving average of $1,686.08, which is my call. The 12x3x3 weekly slow stochastic reading is projected to rise to 30.00 this week, up slightly from 28.74 on Nov. 30. Investors should buy weakness to my semiannual value level of $1,546.97 and buy up to the 200-day simple moving average at $1,700.00. This is the buy zone, given potential up and down volatility clearly shown on the daily chart. My semiannual pivot at $1,804.55 should remain a magnet and the first upside target on the Santa Claus rally.